One of the best study systems is to complete exam tests, with the objective in hand to learn from the errors that we may commit while developing an answer. WordFox is a practical solution to be able to create our own tests and quickly evaluate if we have properly retained the subject that we have been studying. The program has two different sections: one to create the questionnaires and another to solve them, both of which are simple and practical, thanks in part to how simple the interface is, so simple that we will be able to control it with a couple of buttons. The program can import questionnaires in KVTML, T2K, OH4, PWC, BACKPACK, OHR3, VOC, OVR, XML and CSV format. Once we have created our tests we will be able to choose various ways in which to solve the questions (multiple choice, selecting the question instead of the solutions, not being able to move forward in case of an error,...). 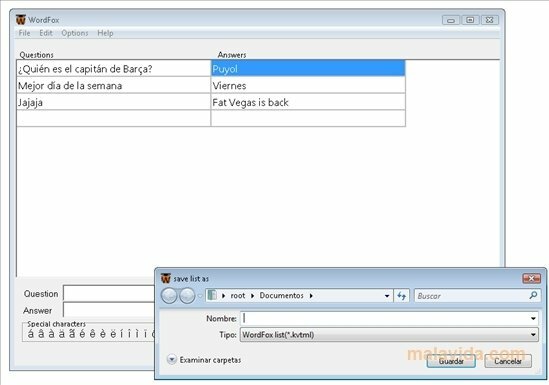 Practice for your example in the most practical way, thanks to WordFox, a free application that can be used by practically everybody.